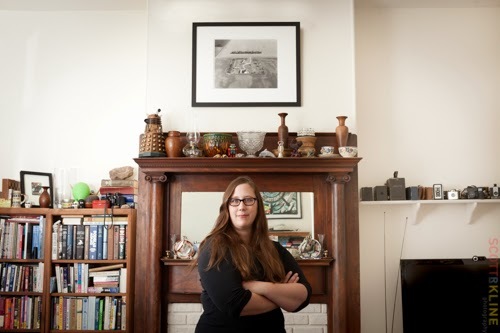 Photographer Sarah Christianson at her home in Dogpatch, San Francisco, CA. For most of us our identities are very much tied to where we grew up. "Where are you from?" 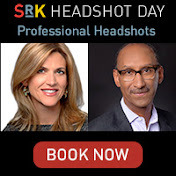 is a typical first meeting question. And it seems assumed that the answer will not be California. No matter where we started, we invariably bring with us the traditions, language and preferences of not just our families, but also of the towns we lived in when we were younger. Like many current residents of California, photographer Sarah Christianson moved here seeking more job opportunities and a broader world view than the small town where she grew up in North Dakota could provide. But she still considered that town central to her identity and more than that, felt the pull to tell the story of the people that still lived there. From that desire came her latest project, Homeplace. The name refers to my family's 1200-acre farm in the Red River Valley of North Dakota. That farm is my center, my homeplace. My family left Norway in 1869 for America in the hopes of finally becoming land owners under the promise of free land as a result of the Homestead Act. They had heard that America was the land of opportunity for those willing to work hard. Since those early years my family has worked the land, growing wheat and soybeans. In 2005 I worked in New York City for a few months and was struck by the contrast between that busy city and my own hometown. I truly saw how much North Dakota was part of my identity. When I returned, I started seeing changes or perhaps I finally noticed them -- my grandfather had passed away so my grandmother had sold that farm and moved into town, my brother and sister moved away and my parents demolished my grandfather's childhood home because it was in such disrepair. It started to sink in that my parents might be the last of four generations to actually work and live on the family farm. I was just entering the MFA program at the University of Minnesota and decided to make my thesis project the documentation of my family's emigration and agriculture heritage through my photography and other archival elements such as historical documents and old family snapshots. I even went to Norway in 2008 to trace the footsteps of my ansectors that had left. Homeplace is the result of this journey. What I realized is that our rich agricultural heritage will continue in some form -- no one can take that away. 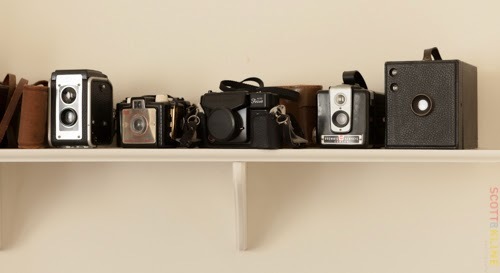 I love photography -- it allows me to tell stories in a visual way. And I feel compelled to tell the story of the people of North Dakota. I feel it is so important to share the perspective of the people that live there with the rest of the world. I recently received a grant from the San Francisco Art Commission for my latest project -- I'm documenting the oil boom that is happening in North Dakota as a result of fracking. It is so important to let the world know how fracking is changing the viability of the land to raise a crop and a family. I moved to Dogpatch in 2011 after I started working with artist Jim Campbell who was located in the American Industrial Building. Dogpatch felt like a small town to me. 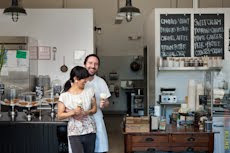 The neighborhood worked well for my city-minded husband Jesse Mullan and the small town girl in me. Part of the small town feel for me is the fact that we know our neighbors and so many people you meet here are so friendly and welcoming. We were looking at an apartment that was for rent on Third Street and decided to go behind the building on Tennessee Street to see what the back of the building looked like. Immediately a Hells Angels member came out of their clubhouse with a pitbull straining on the leash. Both were clearly on full alert and wanted to know what we were doing in that area. But when we told him we were looking for an apartment to rent his demeanor changed immediately. He proceeded to tell us how great the neighborhood is and how welcoming everyone would be to us. And of course the pitbull mirrored this change and flopped down on the pavement! I would certainly try my hand at farming! Photographs from Homeplace are currently on exhibit at Rayko Photo Center until November 17. 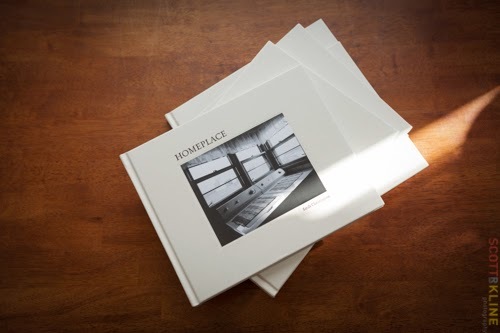 Click here to purchase a copy of Homeplace. Zannah Noe is a painter and mixed media artist. She has created the series American Bones. 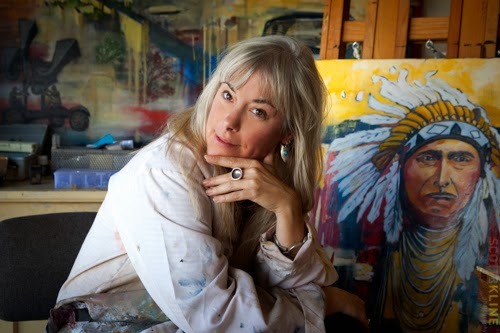 She sits in her studio in Dogpatch, San Francisco, CA on September 25, 2013. We see a wealth of street art on our walks around Dogpatch -- multi-hued hearts hidden on the big AT&T boxes, work vans without a spare square of original paint untouched, the vacant lot on Third Street that every morning sports a new image despite the landlord's preventive measures. But an image that has intrigued us for many months is the stencil of a roller coaster, generally with the words "American Bones"at the bottom, that has popped up on sidewalks, overpasses and then finally, the billboard at the bottom of the 20th Street overpass that usually is advertising something much less interesting. The billboard was very obviously not a sanctioned project with its street art banner look. Not long after the billboard mysteriously appeared we started spotting flyers advertising The American Bones art project that was on display at the studio of artist Zannah Noe on Tennessee Street -- located right next to that 20th Street billboard. We were greeted at the airy light filled loft by the artist as well as by her rescue dog Diesel Lamar, a beautiful and gentle ten year old greyhound. The studio walls were covered with the many creations of this mixed media artist but what caught our eye was the red acrylic 48" laser cut metal stencil of the roller coaster -- the American Bones image we had been seeking. What is the American Bones Project? Everyone has a roller coaster story. It is such an American icon and it transends race, class and gender. The infrastructure of a roller coaster reminds me of scaffolding -- of bones -- of what is left standing. I first used this image of the roller coaster in my series of paintings called Amusement Architecture -- portraits of Coney Island and the Santa Cruz boardwalk. I started wondering, what are the images that represent America now? And just as important, what icons are still left in America? I decided to search for and then document those icons through my photographs and paintings. I was greatly influenced by the book, American Nations which looked at American Regionalism. In 2012 I launched a successful Kickstarter campaign to fund the trip. My mode of transportation is a Chevy van I lovingly call, Foxy Brown, and she consumes lots of fuel! 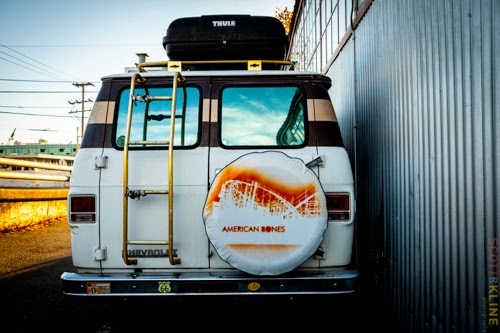 In April 2013 the American Bones road trip began. I traveled throughout the U.S. -- trying to stay off the beaten path as much as possible. I discovered that while some of our remaining icons are obvious ones, such as cowboys and guns, there were also less obvious ones such as water towers. I also discovered that America loves the mash up -- two icons that you wouldn't think go together. For example, White Sands National Park in New Mexico is a park but it is also a missile testing site. But my favorite mash up had to be the Prison Rodeo in Louisana. Only in America could we put together a prison, rodeo and art show all in one place. I love portraying these mashups as public art. Zannah Noe traversed the country in her van, Foxy Brown. Through my art I attempt to reveal what is personal but also universal. The American Bones project very much represents that to me. I love the act of creating, whether it be photography, painting or catering. I grew up in Massachusetts. I studied fine art in college as well as photography. After college, I decided I could only live in New York or San Francisco. I used to think that those were the only two places an artist could live in the United States. Of course I feel differently since my road trip! When I first moved here in 1991 I was a photographer for the club, The End Up. I like to say I started from the End Up! I also did editorial photography for the SF Chronicle and the SF Weekly. I eventually went back to school and learned how to be a web and graphic designer. The catering comes in because editorial and fine arts don't necessarily pay the rent so I also became a caterer, working mostly as a personal chef on yachts. In the 1990s I had a darkroom in this neighborhood that I used. I also photographed a lot of punk bands with this neighborhood as a backdrop. The neighborhood reminded me of a neighborhood I love in Boston, Fort Point Channel. I have lived many different places in the city from the Lower Haight to a tugboat at Pier 50, but it wasn't until 2010 that I finally found a place to rent in Dogpatch. I love the industrial mix use -- almost the feel of an urban desert. It is less so now of course but the creative mix of people are still here. A traveling photo journalist. I certainly became one as a result of this road trip. And we have to ask, why did you name your Chevy van, Foxy Brown? It reminded me of something out of a Quentin Tarantino film. And I guess you could say that the van is also an American icon. 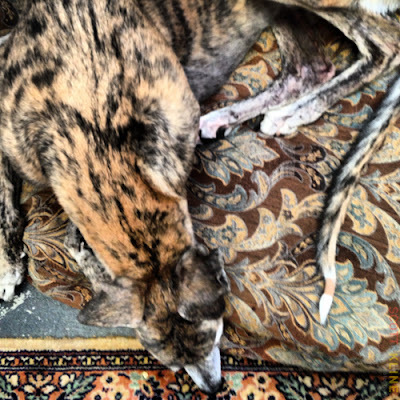 Greyhound Diesel Lamar is the constant companion of Zannah Noe.